I have a difficult time trying to describe how we feel, not because I’m lacking in words, but rather because I am overwhelmed with such intense feelings. It’s like there is a Wordle in my heart, dense and under high pressure, weighing me down. Each day a new emotion is added to the list. 1. Dating of DW’s beta – no big deal but if they are messing that up, what other time-sensitive stuff did they also mess up? 2. Her medication. DW had major irritation from the Endometrin (vaginal progesterone suppository), and so they instructed her to replace the 300mg of Endometrin with 300mg of oral Prometrium. I had a weird feeling about it because often specialists instruct patients to take the prometrium vaginally rather than orally because of absorption issues. I had her call them again to confirm that the dosage and route was equivalent to the 300mg of Endometrin. They confirmed it and she followed as they had instructed. A few days later, she started spotting, which is sometimes normal, except that the spotting became red blood and then a full period-like bleed. At about the same time, the intense nausea that she had disappeared and she started having cramps. Really intense cramps. Which finds that oral Prometrium will test in expected concentrations in the blood, but very little of it actually makes it to the endometrium of the uterus, which is where it is needed. A lack of progesterone will make your uterine lining shed. Now, I’m not sure if there is a threshold amount of progesterone that is required and if we were okay in that respect anyway, but 300mg of oral Prometrium actually is like 30mg of usable Progesterone and is no where close to the 300mg of Endometrin which absorbs almost completely into the uterus. Anyway, we’re in a strange place right now. Part grieving, part blaming (ourselves and the clinic), part next steps. 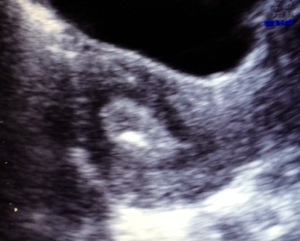 IVF and FET have a much greater chance of success than the IUIs we were doing last year. DW wants another go at it (FET), because she feels like she won’t be a stakeholder in these babies (if they ever become real), but two miscarriages in a row necessitates more investigation into why she isn’t keeping the pregnancies. At the same time, we only have 3 embryos left, and my womb hasn’t had a try yet. Right now my daily life is very difficult to navigate through. I teach at a really rough school, where the kids are extremely disrespectful to teachers and administration. I was successful in transferring to a different school for September, but I still need to ride out the last month and a bit of this year. On a daily basis, I have extreme moments of stress because of my job. In addition to that, everyone around me is pregnant or having babies. 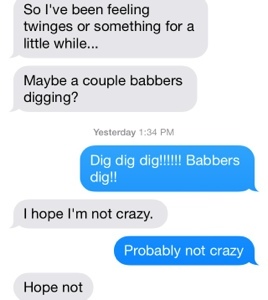 A friend/colleague of mine just found out she is having twins, and is griping about it. All I want is a piece of that, and I feel like with each failed attempt, my image of having children gets blurrier. I am struggling with a lot of emotions and expectations and I feel like my own needs aren’t being met. The problem is, that I am so far down each of these holes that I can’t even find a way to climb out. Things are a bit confusing at the moment. Then she started having brown spotting, that became more and more in volume. And since yesterday morning, the nausea and all other symptoms have disappeared, but mild cramps have started. Yesterday was supposed to be our beta day, but the clinic screwed up and told us it was supposed to be Saturday. They called her yesterday when her bleeding was becoming slightly red, and scolded her for not coming in for her blood test. Imagine how conflicted she is feeling right now. Even though we could have her beta today, DW would like to wait until Saturday, when the status is more clear. I’m trying to stay hopeful, but I can tell that in her gut, DW is preparing herself for an emotional breakdown, and is just trying to make it through the work week intact. I don’t know how to feel right now, but I’m choosing my words very carefully, and letting her lead. 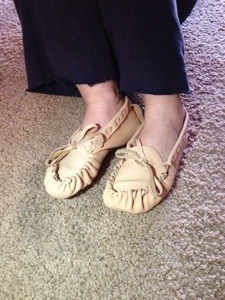 It took about three hours to make one pair, which involved cutting, punching holes, and hand-sewing leather. She says they are the softest things ever! 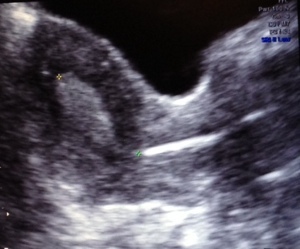 For those who aren’t familiar with the lingo, #DP5DT stands for number of days post 5-day blastocyst transfer. If you want to convert it to days post ovulation (DPO), you add 5 days (because our little blastocysts have had a 5 day head start. 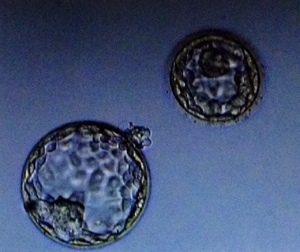 For example: 9DP5DT means nine days post five day blastocyst transfer, and is equivalent to 14 days post ovulation. I used to be a doctor. I still carry the designation, but no longer practice. Specifically, was a chiropractor, and while I loved treating patients, I loathed the managing of staff and running my own business. Often times, I found myself treating people for free, simply because I am a bleeding heart. Things then shifted for me because in order to keep my private practice afloat, I also did independent medical exams for insurance companies, which was incredible money, but I felt like I was working for the devil. It felt dirty, and I felt like I had sold my soul. On top of these two jobs, I was also teaching part-time at the university. I loved this, and was exceptionally good at this, but could not get a full-time teaching position. After three years of juggling these roles, I realized that I needed a change. I was exhausted, demoralized, and never got to see my wife. When I met my wife, she had already been teaching high school full-time for 3 years. We met just as things started to reach critical in terms of my stress level. After one year of being together, I decided to take a leap of faith and go back to school to get my B. Ed. Job prospects were already slim to none at the time, but I had always been passionate about teaching, and getting that degree would open my opportunities to include teaching secondary school in addition to teaching post-secondary. So I did it, and within three months of graduating teachers college, I was offered a permanent contract with a public school board. This is highly unusual. In fact, my case is an outlier. That was almost two years ago, and now, my job might be at risk if a new government party comes into power. Less than a week PUPO, and I’m anxious and worried about how DW and I will be able to support our family if the worst case scenario becomes our reality. The wife had cramps yesterday. That is all. Acupuncture was done before (on the car ride to the clinic) and after (while resting in the lounge chair) transfer by moi.